Amniotic band syndrome (ABS) happens when fibrous string-like bands develop from the inner lining of the amnion (the sac that surrounds the baby in the womb). As the baby develops in the womb, he or she becomes entangled in the bands. The bands then attach to and affect different areas of the baby’s body by restricting blood flow and development. ABS can cause a number of different birth defects depending on severity and which part(s) of the body is involved. If a band wraps tightly around a limb, the limb can actually be completely amputated. The baby may be born with shortened or missing finger or toes, or with part of an arm or leg missing. If the band is across the baby’s face it can cause cleft lip and palate. In a large number of cases, the baby is also born with club feet. There may be an opening in the abdomen through which various abdominal organs can protrude. There may be a protrusion of a portion of the brain and its surrounding membranes through a skull defect. A band can become wrapped around the umbilical cord and result in a miscarriage. A mild band constriction is likely to affect only the outer layer of skin and may not require treatment. Deeper constrictions may block lymphatic vessels, impair blood flow and be life-threatening, requiring immediate surgical care. When the bands affect any of the limbs, the lower part of the limbs are most often involved — especially the middle, long and index fingers of the hand. When the feet are involved, the bands most commonly affect the big toe. Pressure from the bands may result in additional abnormalities, such as problems with the bones or differences in the length of the baby’s legs. Advanced ultrasound technology may detect bands as they begin to appear as thin, mobile lines. Mild cases may not require treatment, but doctors will need to closely monitoring the baby as he or she grows. Treatment of ABS depends on which body part the band is wrapped around and the severity of the abnormality. 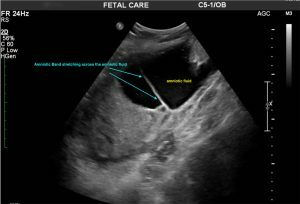 Physicians at Fetal Care Center Dallas are skilled in the use of advanced and minimally invasive surgical techniques for the treatment of amniotic banding. Our fetal surgeon is qualified to perform surgery on your baby in the womb to free limbs from amniotic bands that threaten to amputate limbs. Through ultrasound (link to Diagnostic Testing) guidance, we are able to use small instruments inserted into the uterus to perform a minimally invasive fetoscopy. A fetoscope is inserted with an instrument capable of cutting the bands and freeing them from your baby’s limb, fingers or toes. Reconstructive surgery after birth may be performed to help correct or repair malformations, such as ring-like constrictions of the limbs, webbed fingers and toes, cleft lip or club foot. We have on hand a board-certified pediatric surgeon (link to Bios) who is experienced in a variety of reconstructive surgical techniques to provide your baby with treatment to greatly improve their quality of life.